Father Rocca is stepping down from the job he was born to do, the culmination of his path through the priesthood to become an expert in liturgy, prayer, preaching and sacred music. Rev. Daniel G. Groody, C.S.C., associate professor of theology and global affairs at the University of Notre Dame and an award-winning author and filmmaker on international migration and refugee issues, was elected a Fellow and Trustee of the University at the Board of Trustees winter meeting Friday (Feb. 1) on campus. On Saturday, August 25, five members of the Congregation of Holy Cross celebrated the final profession of vows during Mass at the Basilica of the Sacred Heart at Notre Dame. Rev. William M. Lies, C.S.C., vice president for mission engagement and church affairs, was elected provincial superior of the Congregation of Holy Cross, United States Province of Priests and Brothers, by the Provincial Chapter at its meeting in Wilkes-Barre, Pennsylvania. Since joining the center in 2014, Father Sandberg has directed the Common Good Initiative, a Catholic social teaching immersion course for graduate students with sites in Haiti, Cuba, Uganda, Jerusalem and Detroit. Rev. Michael Connors, C.S.C., has written a new book about the art of preaching, published by Liturgy Training Publications. The book is called Preaching Discipleship: Preparing Homilies for Christian Initiation. On Saturday, April 7, 2018, at the Basilica of the Sacred Heart on the campus of the University of Notre Dame, three Holy Cross priests were ordained to the priesthood - Rev. Christopher Brennan, C.S.C., Rev. Brendan McAleer, C.S.C., and Rev. Timothy Weed, C.S.C. In honor of the 175th anniversary of the University, Father Tom Blantz, C.S.C., delivered the 2017 Cushwa Center Lecture titled, “Fr. John Zahm, C.S.C., in the Founding of the University of Notre Dame” in McKenna Hall on Friday, November 3, 2017. Rev. Edward A. “Monk” Malloy, C.S.C., president emeritus of Notre Dame, introduced Father Blantz. On Thursday, November 2, 2017, Father Dan Groody, C.S.C., will deliver the Fall Flannery Lecture at Gonzaga University in Spokane, WA. The title of Father Dan's talk will be "Passing Over: Migration, Theology and the Eucharist." Founding director of Notre Dame's Center for Social Concerns remembered. Rev. Kevin Sandberg, C.S.C., has been appointed acting executive director of the University’s Center for Social Concerns for academic year 2017–18. Father Sandberg will serve in this role while Rev. Paul Kollman, C.S.C., Leo and Arlene Hawk Executive Director of the Center for Social Concerns is on research leave. Rev. 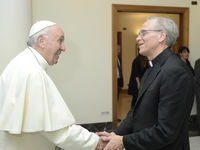 John Jenkins, C.S.C., reflects on Land O'Lakes Statement in "America"
The controversy over the Land O'Lakes Statement has served as a proxy war for conflicting narratives about the legacy of Vatican II, the contemporary state of Catholic higher education and the exercise of authority in the church. From the perspective of 50 years on, with new controversies and a very different papacy, we can perhaps better understand the context, vision, limitations and legacy of the Land O’ Lakes Statement for Catholic higher education and for the church generally. Father Bob Pelton went to Latin America to serve the people there, but he didn’t envision his work for social justice would put his life in danger — as subversive to government efforts there, and here.